Later topic: Antique or not? First Impression with my newest homemade press! A few weeks ago I decided to build a Handpress- style printing press simlar to an Albion or Washington. The idea was to build a machine that was a bit more basic… more traditional in it’s function than my other presses. …. BUT one that could be easily constructed with locally available materials. I also wanted it to be relatively small and portable. So I sold the galley press and started building a Handpress. As it turned out, my creation is not very traditional looking. Instead of using a single screw pushing the platen down, I used two screws pulling the platen downward. This has the advantage of not having to build a large framework to hold the compression loads… thus it can be more easily constructed, IF you can get the screws to turn together. Luckily, Veritas makes a very nice twin-screw vise that works like a charm. It has two very stout screws connected by a chain-drive so that they stay synchronized. This vise mechanism became the basis for my press. The press I made is small/medium sized…. a Royal Octavo (7 x 11) image area, and a 9 x 12 paper size. The base is 4 layers of 1/2” Finnish Birch plywood laminated together to make a 2” thick piece. The platen is a laminated piece, 2 1/4” thick. My experience with other presses tells me that this is more than sufficient to handle the stresses on the small image area without warping. Mathematically, it works like this: if you use a 2 ft handle you get approximately 301.4 : 1 lever ratio, so a 50 lb input force is translated to 15072 lbs ( 7.5 tons)of raw force. Since the chase is 7 x 11 (77 square inches), and it’s typically used at 50% image area, you wind up with 391 psi. This is more than sufficient to print virtually any paper. Anyway…. the press is not finished. It’s still rather ugly, actually. I’ve still got to install some rails for the coffin to slide in and out on, finish the tympan/frisket, and varnish it….. but I couldn’t resist the temptation to “fire it up” early, and test it out. So last night I took an old block and pulled a few prints. The quality difference between this press and my older presses is incredible. The pressure is more than adequate (actually it borders on overkill) and the mechanism keeps the platen perfectly parallel. It’s also VERY easy to work… far easier than with my roller-style presses. I’m sure that the first question someone is going to ask is “How much did it cost?” That’s hard to say for certain since all of the wood came from off-cuts from other projects and I got the Veritas Vise at a garage sale for virutally nothing. BUT if I had to guess what it would cost someone to build it using all new materials, I’d say ~$350 or so. Time-wise, it took just under two weeks of working evenings to build it. So… there it is: A twin-screw Handpress…. a hybrid of old ideas and modern materials. It’s not perfect of course, but it was fun to build and should serve me well for the next few decades. More importantly, I’m hoping that it will inspire other would-be press builders who might be out there. Very cool. I love that vice - it sounds perfect for the job. I also really like how compact it is. Awsome! Veritas/Lee Valley makes some wonderful tooling. Is it possible to shim one side to calibrate your setup? Or would you just do that in makeready? Or perhaps your woodworking is already perfectly square? The advantage to a single-post handpress was that the platen was basically self-adjusting to provide even pressure on the whole plate. LRF- That’s one of the beauties of the Veritas Vise. The chain mechanism is adjustable, so that you can set the screws so that both sides of the platen press exactly the same. As far as front/back alignment goes, there is just enough play in the mechanism so that the platen is more or less self-aligning…. much like a single screw press. I ran my first large run on it over the week-end, and it worked perfectly. I found that you do not need to grind down the screws to get a good impression, just 20 lbs or so is enough to print a full chase. It is lovely. I was thinking of that myself, but I would like to actually make something that resembles the Gutemberg press. I don’t know if I will do it or not, but it doesn’t get off my head, he he. Your invention is quite interesting. HD- Thanks for the comment. After finishing and the addition of rails for the bed, it does look a bit better but it’s still not very “tradtional looking”. Functionally, it works very similar though….. and that’s what I was going for. Has anyone tried to do something like this with an inexpensive hydraulic jack? You could rig it with a digital scale to have repeatable results. A Vandercook is out of reach for most people, myself included, but a large-format platen press is perhaps not so difficult to construct. A blacksmith I know built a hydraulic forge out of off the shelf parts. He used two hydraulic rams with an equalizing line between them so they both have the same pressure in them. 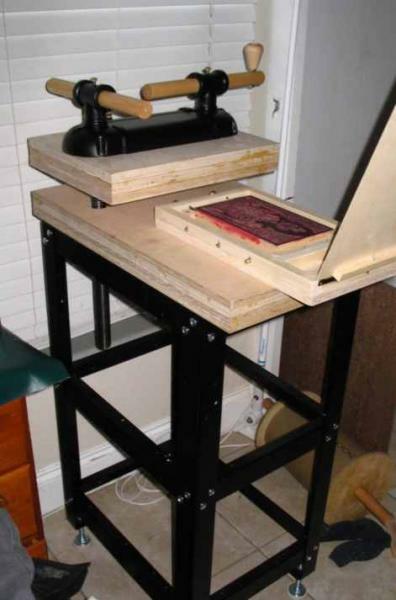 You could make a platen press that is maybe 24” by 36” for a couple hundred dollars. It could have as many rams as needed, so long as they were all linked by equalizing lines. It would not be very fast, but I’d guess some of us are not overly concerned with speed. 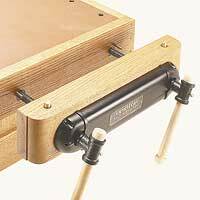 Actually, quite a few artists use “bottle jack” presses made using plywood bases and platens, with small hydraulic jacks as you describe. I’ve not built one, but those who have used them tend to like ‘em. About the press in this thread: it ultimately was a failure. As it was used, the chain mechanism wore unevenly, and the chain adjustment wasn’t up to the task. Thus the pressure became inconsistent across the platen. In the end I disassembled it….. and the base you see in the pic is now under my Showcard press. The screws are out in the shop awaiting a new project. It was this press that ultimately convinced me to stay with cylinder machines. Well, if you learned from it, then it was not really a failure. My first press, if you can call it that, was an old Mimeograph machine I bought at a second hand store for five bucks. It had its quirks, but the rotary construction made a lot of sense then and it still does. Hmmm… Mimeo stencils and blankets on top of the Boxcar Base… no longer need rollers or plates, typesetting by Underwood. Nah… silly idea. What I would like is a large format press that I could print my books as “coffe table books” using a full sheet of standard paper as a single leaf. 24 x 36 ought to be about right. Its been many years since I had access to a lathe or a milling machine though. Something I thought of earlier was a large box filled with sand that would be raised above the “platen” with a block & tackle. I’ve got one that I used to lift a Farmall Super C and suspend it from a beam when I was a stupid kid with too much time on my hands. Anyway, you could tie the rope off, ink up your plate, position your paper on the bottom of the box and lower it down onto the plate, then lift it up. Does this sound dangerous to anyone else? I figure I’d need about a thousand pounds of sand supsended by a rope while I arrange stuff underneath it. Probably would not get UL approved. If you recall, I did a study on the pressure required for relief printing a few years ago (http://www.briarpress.org/9067). During that discussion, we all seemed to agree that ~150psi is the minimum for good results, up to maybe 400 psi or so. That seems to indicate to my simple way of thinking that 90,000 lbs (45 tons) would be the magic weight. That seems a bit tough to support from a beam. (then again, I haven’t seen your shop. Do you have a 36” steel beam in your roof structure? ) BUT if you go with a roller / cylinder using gravity alone then your cylinder only need weight ~450lbs. That seems quite doable. Uh… no, I do not have capability to lift 27 tons. 450 lbs. though, lessee now, a twelve-inch diameter piece of PVC pipe 24” long filled with lead shot would give us a maximum printable area of 37.68 x 24 inches… close.enough and probably heavy enough (envisioning in my mind the size of a 25 pound bag of lead shot). 24 x 36 Boxcar Base for the platen…. hmmm… largest they make is 24 x 24 at $1,150.00… say a custom job at $2,500.00 then. So guestimation of the total cost maybe $5,000.00? ‘bout half the price of a Vandercook. So, yeah, it would probably be doable and even practical. Now, if I only had the time and the money at the same instant, maybe I would look into it. First I gotta get famous and have them start making movies from my books. At 62, though, I am a little late to this party. the 34x26 platen is a 50 ton hydraulic capacity. Granted, these are for paper making; different from printing; but I know people at Pace Paper use this exact kind of press to great effect producing editions in relief after the sheets are formed and dried. the 50T hydraulic press certainly looks more practical than 45T of dead weight…. By the way, I like Carriage House’s new website. That mid-sized Reina Hollander Beater is a nice looking piece of equipment.